Woollards of Mildenhall is a family run business, which has operated since 1947. We are experts in creating design solutions for the home, which are customised to meet the individual needs of our customers. We can design and install kitchens, bathrooms, fitted wardrobes, and bedroom furniture, which is only a fraction of the services we have to offer. Our extensive showroom facilities are located on a three-acre site in Mildenhall, with ample free parking and within walking distance of the town centre. Our kitchen showrooms have over 20 kitchens on display. We have a wealth of experience in providing innovative design concepts for the home. We pride ourselves in looking after our customer's individual needs and providing a high quality service. Our aim is to provide absolute satisfaction with a unique customer experience second to none. Our extensive experience in design, product selection and taking care of our clients has been used to develop a fresh, more thoughtful approach towards transforming your home using the best innovative design solutions. We have proven track record of delivering projects on time and within budget. Our services cover the King's Lynn area, so if you are looking for kitchens, bespoke kitchens, German kitchens, wardrobes, and fitted furniture in King's Lynn, then you have come to the right place. In addition to King's Lynn, we also cover areas such as Ipswich, Cambridge, Thetford, Newmarket and surrounding areas. 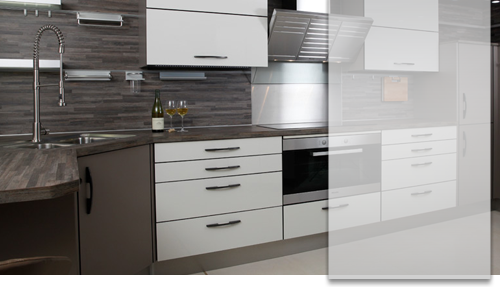 We are able to provide the inspiration for innovative design solutions and fitting services for german kitchens. We also have a large variety of bathrooms, luxury bathrooms, fitted wardrobes, and storage solutions to cater for a range of budgets and tastes. We are confident that we will be able to inspire you with a variety of different finishes and styles. Why not visit our bathroom showrooms to see the large selection of different bathroom suites and products we have on display. Our skilled staff members can help you achieve your aim, whether it's to maximise storage, increase space, or simply to add elegance and style to your living space. What makes Woollards of Mildenhall stand out is that we have no "salesmen". From your very first visit, you decide when you would like to speak directly with one or more of our experienced design experts. We will not put you under any pressure, we won't ask for your name or contact details. You will need to offer your contact details to us, so may we courteously invite you to experience the difference which makes us who are, as seeing is believing! After an initial discussion, usually to include a visit to your home, our designers will produce a stunning, almost 3D image of your new kitchen, bedroom, home office or bathroom once they have an understanding of your needs, goals, hopes & dreams. This will help you visualise just how your updated room will look in your home. Please bear in mind that technology is just part of a process that absolutely depends on traditional expertise and meticulous attention to fine detail.